Fall Wanderings in Washington D.C.
Spring in Washington D.C. is the favorite season for visitors, especially because of the city’s famous cherry blossoms. Fall, however, is a close runner up, as the leaves on trees turn to golden yellow, fiery red and bright orange and the crowds of visitors begin to thin out. This is a city made for walking and during our visit there a few years back we made the most of it. It’s also the city with the most free attractions in the U.S. – perfect for these shoestring travelers. 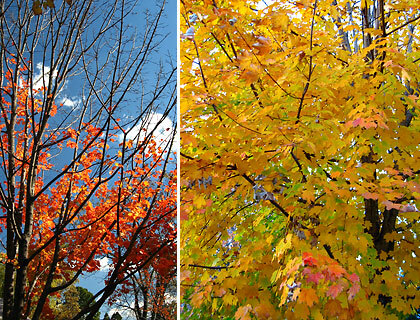 Autumn colors in and around Washington DC – left: Bethesda; right: at Georgetown. While visiting Nina’s aunt in Fort Belvoir, Virginia during fall a few years ago, we were able to take plenty of time to visit the city. On one or two occasions, Tiyo Rene and Tiya Tess dropped us off at a location we had chosen for the day. But for the most part we took the Metro downtown. We then hopped around the city while our hosts went straight to work. Washington DC’s Metro is clean and user-friendly, making it easy to visit the more popular sites of the capital. Taking a car around the city is actually a bad idea because of the traffic and lack of parking space (although the former pales in comparison to Manila). Something that one immediately notices about this city is the lack of high-rise buildings. This is due to the capital’s famous height restrictions on structures. We’ve learned that this was done to protect the sight lines of the popular monuments downtown but has also resulted in congesting the city and making traffic such a problem. The most popular tourist spots are to be found on the National Mall – or simply known as the Mall – a two-mile long expanse of parkland containing a dense concentration of monuments known the world over plus several museums including the Smithsonian. The Mall stretches from the Capitol Building on the east, home to the US House of Representatives and the Senate, to the Lincoln Memorial and the Potomac River on the west. The various monuments and museums are so close to each other that it is convenient to explore all on foot – a definite plus for these shoestring travelers. 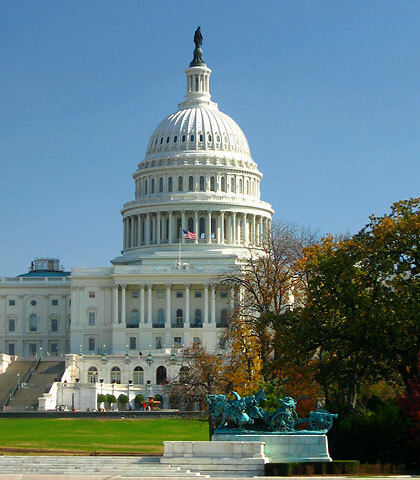 The Capitol Building on Capitol Hill marks the eastern edge of the National Mall. 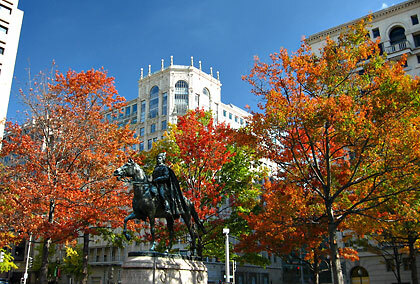 The Ulysses S. Grant Memorial is in the foreground. We spent much of our time walking around the Mall and hanging around its many attractions. The cool autumn air made walking here pleasant. (The Mall is over 3 kilometers long but in person it looks deceivingly shorter.) At its eastern end is Capitol Hill  home to the center of the US government’s legislative and judicial branches: the Capitol Building and the Supreme Court. 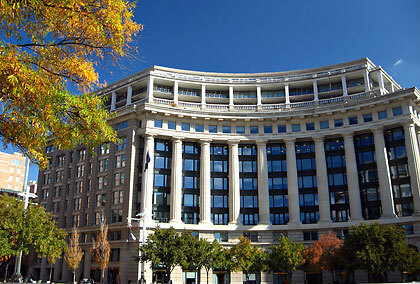 The Library of Congress, containing the world’s largest collection of books is also located here. We were looking forward to seeing the White House, located in the northern part of the Mall but later discovered that due to security issues they had closed down the Pennsylvania Avenue section from which we could have seen the more popular (and more photographed) South Portico of the White House. We had to settle for the less recognizable North Portico as a result. 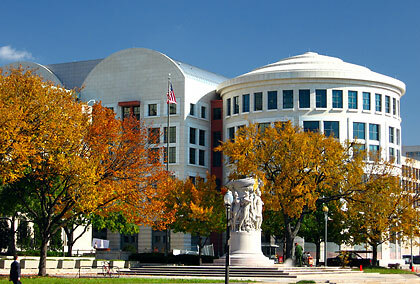 The E. Barrett Prettyman Courthouse with the Gen. George Meade statue in the foreground, downtown Washington D.C. The Mall’s share of monuments and memorials is unrivaled not only in America but probably the world over. 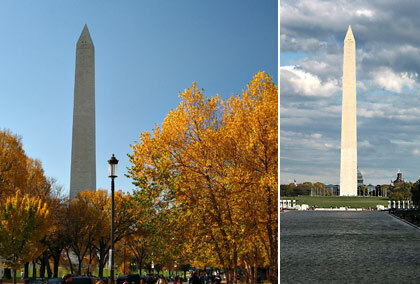 Most impressive for us is the Washington Memorial with its intriguing design (and plenty of conspiracy theories to boot). At 555 ft. it is Washington DC’s tallest structure and the tallest obelisk and stone structure in the world. Standing near the Lincoln Memorial and viewing the Washington Memorial from across the Reflecting Pool, we would reminisce about the many films featuring this scene, most specially the one in Forrest Gump. But probably the most memorable moment featuring the Reflecting Pool is the Rev. Martin Luther King’s “I Have a Dream” speech to a gathered crowd of 200,000 decades ago. The Washington Memorial: where’s Forrest Gump? The Lincoln Memorial (top) with Abraham Lincoln’s imposing statue inside (bottom). 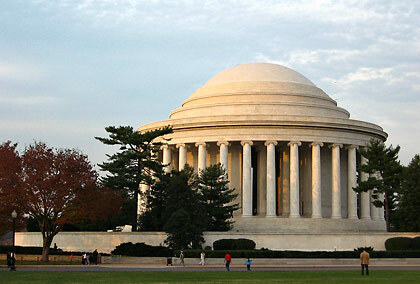 The Jefferson Memorial on the bank of the Tidal Basin is a circular, open-air building. We were not able to get inside as it got pretty late by the time we arrived near the banks of the Potomac River. In several pictures you’ll see the Jefferson Memorial framed by cherry blossoms in spring but on this fall afternoon the view wasn’t bad at all as the setting sun cast its copper rays on the marble facade of the memorial. The Jefferson Memorial on an early evening in autumn. Several memorials honoring the men and women who served in the various conflicts of the 20th century may also be found in the capital. The National World War II Memorial is one of the newer ones and commemorates the 16 million U.S. service men and women who served in that war, including the 400,000 who paid the ultimate sacrifice. The only local memorial in the Mall is the D.C. War Memorial, dedicated to local Washingtonians who fought in the First World War. Probably the most famous war memorial in D.C. and certainly the most poignant is the Vietnam Veterans Memorial. A black granite wall in this memorial is engraved with the names of more than 58,000 American troops who died or went missing in the Vietnam War and one cannot help but feel a sense of awe and sadness while viewing the rows upon rows of engraved names. We missed visiting the Korean War Veterans Memorial which happens to be somewhat hidden from view in a wooded area. Reflecting later about this, we realized that this is indeed a memorial to the so-called Forgotten War – a war that is actually still not officially over despite costing millions of lives. The U.S. Navy Memorial on Pennsylvania Avenue. The US Navy Memorial on Pennsylvania Avenue honors those who have served with several branches of the American Military namely the Navy, Marine Corps, Coast Guard and Merchant Marine. We also visited the Marine Corps War Memorial which happens to be outside Washington D.C. and part of Arlington, Virginia. 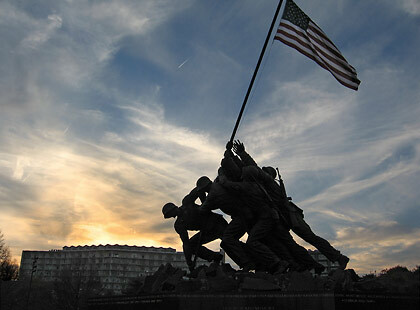 Just outside the walls of the Arlington National Cemetery, it is also referred to as the Iwo Jima Memorial. The centerpiece of this memorial is a massive sculpture of marines famously raising the Stars and Stripes atop Mount Suribachi during the bloody battle for the island of Iwo Jima in 1945.
flag-raising on Iwo Jima in World War 2. Besides memorials and monuments, Washington D.C. is also home to a large collection of museums, many of them among the best in America. Easily the most famous is the Smithsonian, which is not a single museum but actually a collection of 19 free public museums. We spent a whole day here viewing the collection of spacecraft and airplanes at the National Air and Space Museum to the huge, complete fossil remains of dinosaurs at the National Museum of Natural History. 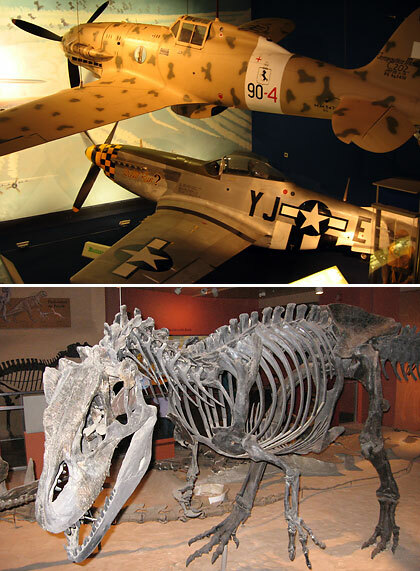 (The two are the most popular of all the museums of the Smithsonian.) Other favorites are the National Gallery of Art with its stunning array of world-class collections from traditional European art to impressionist, fauvist and abstract expressionist paintings and sculptures, the National Museum of American History and the National Museum of the American Indian. We could only pass by briefly at a few of these museums – such is the overwhelming feeling you get when confronted with such a wide array of choices. And newer ones are being built with the National Museum of African American History and Culture set to be completed by 2015. The Smithsonian includes museums that contain a huge and excellent collection of historical artifacts from prehistoric to modern times. Top: World War 2 American & Italian fighter planes at the National Air and Space Museum. Below: a prehistoric dinosaur’s complete skeletal remains at the National Museum of Natural History. There are also quite a number of museums just north of the Mall including the Newseum, the International Spy Museum, the National Portrait Gallery, the American Art Museum, and the National Archives which houses the U.S. Constitution. In retrospect we should have budgeted more time to see the various museums as this was a once-in-a-lifetime experience for us. Equally fascinating as these museums is the historic neighborhood of Georgetown, situated along the Potomac River with its old colonial buildings. Georgetown used to be a separate municipality until its integration into Washington D.C. after the Civil War. It is home to Georgetown University and was used as the setting for the 1973 horror film The Exorcist. A long staircase in this village where that movie’s final, climactic scene was shot has become famous as the Exorcist steps. It was almost winter and the leaves have fallen from most of the trees when we left Fort Belvoir and headed back home to sunny San Diego. Before bidding farewell to this part of America, however, we took the chance to visit Filipino friends who have migrated to such places like Silver Spring, Bethesda, Arlington and Petersburg. Washington D.C. is now a distant place but the passage of time has not dulled our memories of these friends and the places we visited. They still remain very fresh in our minds to this day.